Other Ingredients:microcrystalline cellulose, dicalcium phosphate, magnesium stearate, hypromellose, silica, glycerol. I gave SagaPro to my 93 year old "mom" and it works great for her. I have shared it with others and they all want more! It works! I would like to say thank you for such great products. 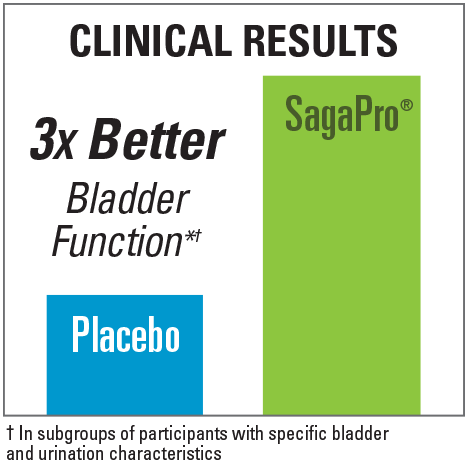 I gave my 88 year old dad some SagaPro Bladder Health for his bladder. * He is taking the SagaPro now and sleeping almost all night. Thank you. Thanks to SagaPro I am no longer preoccupied at every event. My quality of life has clearly increased! I would never go a day without SagaPro now. It truly is fantastic and I would recommend to anybody looking for bladder support. * I now have my own dance school and can teach for hours without any trouble, it has helped me tremendously! Thank you, SagaPro for helping me get back to doing what I love! I am very happy to have discovered SagaPro! After only a few days, I have seen great improvement.